Burt Bacharach and Hal David's powerful ballad from Promises, Promises was made famous by Dionne Warwick and recently showcased on Glee. 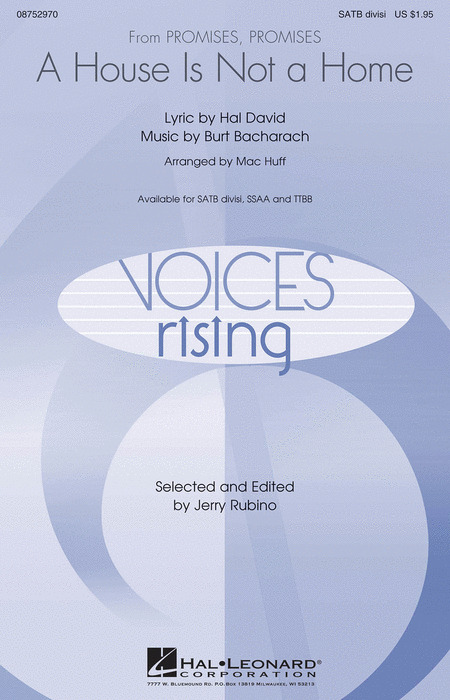 Vocally challenging and full of deep emotion, this setting offers rich rewards for concert and pop groups. Burt Bacharach and Hal David's powerful ballad "A House Is Not a Home" was made famous by Dionne Warwick and recently showcased on Glee. Vocally challenging and full of deep emotion, this setting offers rich rewards for concert and pop groups. Now in an exciting a cappella setting of "Seize the Day". the showstopper from the award-winning composer Alan Menken, was featured in the Disney film and Broadway musical Newsies. It begins with a compelling chorale-like opening and then explodes into rhythm that encourages us all to "seize the day!." Surely one of the greatest songs of all time, "With a Song in My Heart" the Rodgers & Hart's classic romantic ballad, will produce warm smiles all around as you luxuriate in the lush harmonies of this superb a cappella arrangement. The beautiful song "It Only Takes a Moment" from Hello Dolly in a lush a cappella ballad setting! With heartfelt lyrics, rubato phrases, and rich choral harmonies, this will be a wonderful feature for jazz, pop and concert choirs. Displaying 1-1 of 1 items.